Starting from as low as $899 to move from Miami to Ocala (or moving from Ocala to Miami). Only Straight deliveries. No waiting! Whether you are moving to central Florida, or any other part of the Sunshine State, Easy Florida Moving is proud to show you comprehensive relocation solutions which will leave you completely hands-free from your next move. Moving from Miami to Ocala, Florida? We will show you why should you pick us as we are the Miami’s best moving company! Packing items in blankets and boxes, all the heavy lifting, labeling, and unloading is our movers’ job. All you need to do is just enjoy yourself, or explore the new place you have just moved into. If your new office or home is being renovated or is just not yet ready, we can offer you our convenient storage facilities. No rush, no headache, no problem. 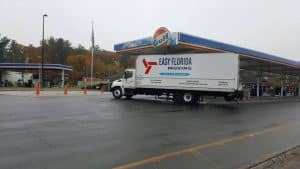 Easy Florida Moving is a company that can take of any move, no matter if you are a family or a business owner, if you are moving to another state, or locally. If you have any heavy and bulky furniture, lab equipment, computers, or if you are moving a piano from Miami to Ocala, we will make sure your special valuables will be properly taken care of. You may ask our movers to assemble your furniture for you or take it apart when moving from Miami to Ocala, FL. Let’s Get Moving With Us! Our warm team of Customer Support employees can answer any of your questions, any time of the day and the week. Fixed Price, or as we call it Flat Rate is what makes us different from the rest of the South Florida Movers. We would like you to be sure in the price we offer at first. We are famous for matching the best quality packing materials with your move. We always carry extra blankets, dollies, and new boxes, so that your valuable items will get the treatment they deserve. Your items will be insured, so you do not have to worry about a thing! We are Miami’s licensed and insured mover, that is well-known and trusted. Easy Florida Moving is a Top Choice Miami to Ocala Mover, who will maximize your enjoyment while relocating. Leave this hard and complicated business to the professionals and enjoy your time with your family and friends, while we help you with moving from Ocala to Miami, Florida, or vice versa. Whenever you give us a call, we will talk about more reasons why we are the best moving company in Florida and provide you with a free, no-obligation quote!